The fact that the moat; fosse, or ditch may have been filled up or drained long ago, and converted into a cabbage or pleasure garden, as in the case of our own Towel of London, detracts but little from the interest we take in examining the traces of the "what once was"! Imagination loves to con­jure up the scenes and deeds of which the moat and its enclosure formed the stage and back­ground. But when we are wandering round some well preserved specimen of a moated house, and can actually behold in their com­parative integrity all the means and appli­ances incidental to this primitive protection against attack, it is a pleasure not easily forgotten. Happily there are many oppor­tunities for indulging in it, in a greater or less degree, yet remaining. Railways and building societies have spared some of these glorious relics of the past, where we may still see the well filled moat and drawbridge, albeit water-lilies and duckweed encumber the former, and a permanent entrance to the building is established by the no longer mov­able condition of the latter. The castles of Hever and Bodiam, and the Mote-house at Ightham, present amongst many others con­spicuous cases in point. Ightham being within easy access of Sevenoaks, is fairly well known to the Londoner who is endowed with artistic or antiquarian tastes. It is a place rather to be seen than described, and should tempt even the mere idle rover now and again into the fair, well wooded, hop­ bedecked garden of Kent. There is a village of the same name also, well worthy of atten­tion, and a hamlet called Ivy Hatch, at the head of a steep, descending, rough, winding, green lane, which brings the visitor within view of the house. On approaching it he finds himself in a garden so quaint and old fashioned as to make a fitting pre­face to the historic pages embodied in the weather stained pile itself. Access to the house from this" pleasaunce" is gained by a grey stone bridge over the deep green water of the moat, out of which rise the "hoary walls of the ancient structure - walls that have been lighted up with the summer suns and beaten by the winter storms of five hundred chequered years." You enter the courtyard through the ancient tower sur­mounted gateway. Here is a description of what then meets the eye, by one keenly alive to the charms and sentiment of the spot. "A picture of carved and fretted gables, clustering dark-red chimneys, quaint door­ways with curious moldings, mullioned windows with leaden lattice panes, filled in here and there, with stained glass. Some portions of the ancient structure are half timbered, the beams brown and bent with age; others are of substantial stone, the different periods being happily combined into one most pleasing whole. Crusted all with moss and lichen, time toned into a harmony of many hues, and overgrown be­sides in places with trailing creepers. A poem in architecture; a picture rather than a home raised to suit man's convenience: a spot an artist might conceive on canvas but scarcely ever hope to find actually existing ­a romance in building made beautiful by the bloom of centuries eye delighting to look upon: fascinatingly interesting, for every stone seems to be fraught with the memories of the long-ago." The chief features of interest internally are the baronial hall and the private chapel, al­though the character and accessories of all the rooms claim in their degree equal atten­tion on the score of their picturesque an­tiquity. The hall, dating from the four­teenth century, is very striking, with its arched roof, springing from the decorated corbels at its juncture with the walls, and the huge fire place where, on the iron dogs of the wide open hearth, must have blazed a succession of crackling logs, lighting up many a scene of revelry, whilst the chapel, now wearing an aspect of neglect, betokens the indispensable penance which succeeded the high jinks. Human interest never fails to blend with those old buildings; to our modern views, they stand as legible records of past romance, and very fittingly does that one associated with Dorothy Selby claim a place here. This daughter of the house is said to have been mainly instrumental in deci­phering the meaning of the anonymous letter received by Lord Monteagle, warning him of the Gunpowder Plot. History and mystery, plot and counterplots, dark deeds, ghostly warnings, haunted chambers, secret panels, tapestried walls and the rest, all mingle and contribute to the romance, as one's footsteps echo on the winding stair or creak on the floor of deserted room and corridor. Without the traditional Dorothy or Mariana no history of a moated house could be complete, and he who is not prepared to hunt up the legendary lore of the subject fails to extract from it the due amount of fascination. For the time being at least, everything should be accepted as ben trovato. "There stood in its perfect calm, that old mansion, with all its gables, towers, and twisted chimneys, with its one solitary wreath of smoke, ascending above its roof, and around it neither habitation nor any other visible object nor sound of life. Its hills and woods seemed to shut it in to a perpetual lone­liness; and the gleam of still waters came dimly here and there through the openings of overhanging boughs. I hastened down into the valley, and plunged into the woody shades! I passed the head of those nearly hid­den ponds, and as I approached the house its utter solitude became more and more sensibly felt. It was the moated grange of Tenny­son. You might quite expect to see Mariana watching at one of the windows. The moat was not as most old moats now are - dry, and become a green hollow, but full of water as if necessary for defense. As you drew near, the garden on your left, leading down to the house, remains in the style in which it was first laid out some centuries ago." To return to the county of Kent. Next in importance to Ightham is Hever Castle. This, like others of its kindred, stands in a valley, for the sake of drawing from the river winding through it a perpetual supply of water for the moat. The important fact that such erections were commanded by the surrounding heights was of no moment in the days before guns of long range or arms of precision were invented. Thus the village and church of Hever, near Penshurst, look down on the grim embattled pile of feudal times - a surprising and significant object to find in the midst of the pastoral pan­orama. No more beautiful specimen of the sort is extant, nor one perhaps in a better state of preservation, seeing that preserva­tion rather than restoration has been the purpose of its successive latter-day owners. The history of such a stronghold must teem with interest, but we cannot do more than very briefly outline it here. It was erected in the Hundred of Somerden, a quarter of a mile north of the village on the banks of the river Eden, by Thomas de Hever, in the reign of Edward III., who obtained free warren and liberty to embattle his mansion. 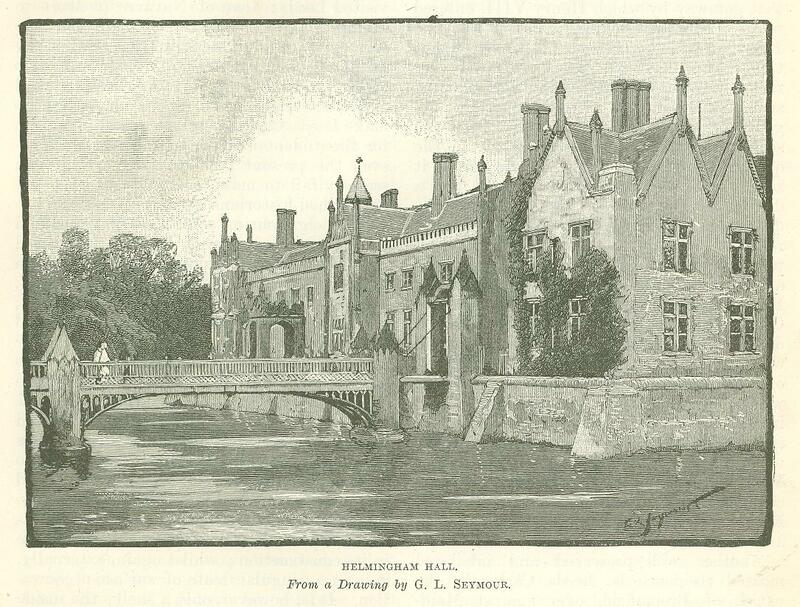 His daughter Joan (co-heir to his son, William), brought the castle in mar­riage to Reginald Cobham of Starboro. 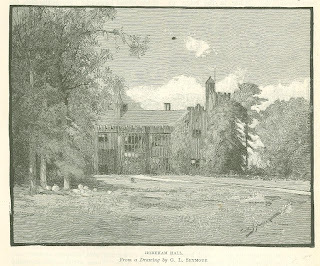 During the reign of Henry VI., the property was purchased by Sir Geoffrey Bullen, Lord Mayor of London, and father to Sir Thomas Bullen, elevated Earl of Ormond and Wilt­shire, whose daughter was Anne Bullen (or Boleyn.) 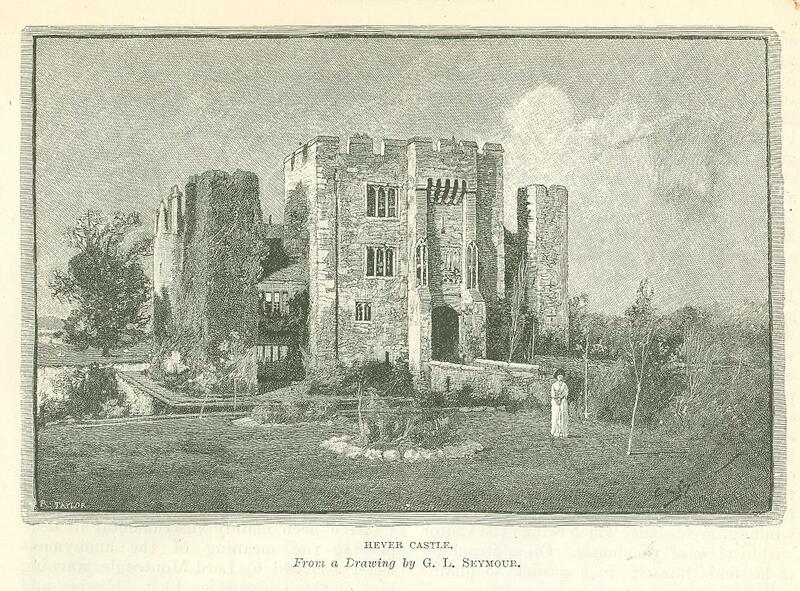 On attainder of Geoffrey Bullen Lord Rochford, the castle escheated to the Crown. James I. gave it to Sir Edward Waldegrave, Bart. ; whose descendant, James Lord Waldegrave conveyed the property to Sir William Humfreys, Lord Mayor of Lon­don, 1716. To come to a more modern date, it was lately in the occupation of Edwin Heard, Esq., as tenant of E. W. Meade­ Waldo. The brass to Sir Thomas Boleyn in the parish church of St. Peter is, we believe, one of the five "garter brasses" in England. 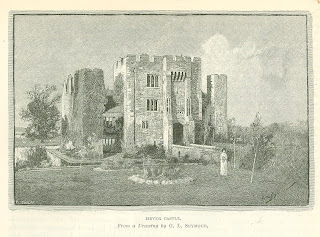 More attractive however than these de­tails is the picturesqueness of Hever Castle, and the romantic picture it presents in its groupings and combinations of grey battlements, shattered towers, Tudor-mullioned windows, gables, and turrets. Infi­nitely impressive is the approach to the great gateway across the well filled stagnant moat, that gateway by which Henry VIII. entered when on his love making mission to Anne Boleyn, for Anne Boleyn is the heroine of this drama in stone. Its castellated cha­racter with the portcullis and machicolations surmounting it, tells eloquently of the by­gone contentions of which it has been the scene; and when once standing within the quadrangle upon which the gateway gives, it seems as if the modern world were but a dream! "The near, afar off seems, the distant, nigh: The now, a dream, the past, reality." Doubtless, the merry band of painters who, one summer only a few years ago, became the temporary occupants of Hever Castle, must have felt the force of Goethe's words, and have often found it difficult to realize that they were living in this nineteenth century. During the progress of the choice bits, and the backgrounds which many of them painted, they must indeed have been carried to a height of enthusiasm by their surroundings entirely unattainable in the studios of St. John's Wood or Kensington. It is impossible to conceive a more admirable spur to an artist's imaginative faculties than a residence in such a home. Another well preserved and inhabited moated residence is Leeds Castle in the parish of Broomfield, over against Maid­stone. Various periods are represented in this structure. It takes us back even further than the Wars of the Roses, and was largely added to, especially in the keep, in the reign of Henry VIII. ; whilst the comparatively modern additions and repairs, chiefly made in 1822, it may be said, bring it up to date, but time has blended the whole together so harmoniously, that one is never shocked by . incongruities of style. Situated in the midst of a deep and extensive lake, mainly created by the damming. up of an adjacent tributary to the Medway, and built upon three islands, each connected with the other by draw­bridges, it must have afforded an almost impregnable retreat, in the pre-gunpowder days. Indeed, it was an important fortress, commanding as it did the approach to Can­terbury and the sea coast. As usual, the main drawbridge is now replaced by one of stone, but the time worn hoary old bastion­ walls protecting the gateway still stand, and give a very significant idea of its former strength. This is said to be the oldest por­tion of the building, but everywhere the scars and brunts tell tales legible to all, and complete a picture not easily to be ex­ceeded for interest and beauty. Richard II. visited Leeds: Joan of Navarre (consort to Henry IV.) was imprisoned here for con­spiracy against her stepson; the trial of the Duchess of Gloucester, 1440, by Bishop Chichele, with a host more of historical events too numerous to specify here, tend to make Leeds Castle a veritable mine of wealth for the student of antiquarian history. Whoever the present residents may be, it can scarcely fail to make everyone of them ac­complished historians and archaeologists. The neighboring county of Sussex would compare favorably with Kent in its moated buildings, even did it possess none other than Bodiam Castle, which, in itself, up to a point, is almost unique. Of no very vast extent, it is nevertheless perfect for what it is, and externally at least presents very much the same appearance now that it did at the time of its erection in 1386, save of course that the exposure of the stone to centuries of weather has rendered it grey and hoary, and tinted it with the tones of moss and lichen. Its founder, Sir Edward Dalyngrudge, could he "revisit the glimpses of the moon," would instantly recognize his ancient property. But that the outside then was new, and now is old, antiquarians tell us there is no difference in its construction; whilst again, externally, it is in a singular state of surface preserva­tion. It is, however, only a shell; the inside being ruinous to a degree in many important features, and quite uninhabitable. The moat too, broad, deep, and pellucid, cannot have much changed, and in quiet weather will, in places, reflect the tall walls and towers of the picturesque old pile with the same fidelity it displayed in feudal times, when mail-clad knights thronged in and around it, and summoned the raising or lowering of the drawbridge with clarion notes. Lovely water lilies here and there abound, that might by a stretch of the imagination be likened to fairy platforms by which to gain access to the erewhile portcullised gateway, were it not that a solid arched structure now replaces the ancient drawbridge. In some lights the effect of the alternate square and round towers breaking the lines of the four walls is very charming, and nestling as it seems to do like its fellows in the bosom of a verdant valley backed by wooded hills, the landscape painter might travel far ere he discovered a; more alluring subject for his pencil. The ground plan is a simple square with a loop-holed circular tower projecting at each corner, and from which the bowmen of yore commanded a wide range of the ap­proaches. The intermediate four square towers present an agreeable contrast in the general lines, and except that the owl and bat may now find undisturbed security in these lofty turrets, there is little, as we have said, to suggest the vast span of years which have passed away since the building of the stronghold. Ugly and philistine as the idea may be, one might suppose that if the whole outer surface were scraped and cleaned, and in a few parts made good with similar stone, the drawbridge replaced, and the moat cleared of its peaceful greenery, a very per­fect picture would be presented of a feudal castle literally as it looked in feudal times, but without its keep, for Bodiam has none. A pleasant excursion may be made to it from Hastings, either by train to the village of Robertsbridge or by the high road. A little hamlet close to the castle and bearing the same name offers fair country quarters for man and beast. The tidal river Rother, albeit here but an insignificant stream, finds its way through locks and sluices from Rye to the village, and affords the principal means of supplying the inhabitants with coal and other necessaries. Formerly it is said the monks from Battle Abbey owned a wharf here. The Rother divides Kent from Sussex, and since we have stepped over it into Sussex we may say that that county abounds in ancient strongholds - strongholds, that is, more or less. None of course to compare with Bodiam and Hever, but very useful to the meditative wanderer, as marking the "revolu­tion of the times," the progress of civilization. From the domestic hearth of the present day villa we may gradually return by aid of these old crumbling piles to the ordinary moated manor house, the abode of a com­paratively humble squire, thence to some completely fortified though not extensive castle, but sufficiently formidable to make it a fitting stepping stone back to the stern, grim, castellated, beturreted fortress such as that of Bodiam - to the clays when, literally, a man's house was his castle. Of the smaller, or moated farm house sort of home, a specimen may be found called Great Wigsell not very far from Bodiam, to which it offers a striking contrast. Deserted, de­caying, and highly pictorial, the present structure is nevertheless of no great antiquity, seeing that it dates back only to 1641, by which period moats for purposes of defense were discarded. Yet it clearly occupies the site of some very ancient mansion which relied on this form of security from attack; for there is the well marked deep fosse now doing duty as a peaceful orchard. It is noticeable mainly as representing another class of the "moat defensive" to a house. Passing into Surrey for a moment, since we are so near, attention should also be drawn to one more house of the same caliber, as still farther illustrative of our subject - except that in this case the abode is main­tained in good repair, and all things done to preserve its character. The moat is filled, the house is inhabited, the gardens flourish, and the old world aspect of the place is most consistently retained, and combined with the latest conveniences of modern life. This is Great Tangley near Guildford. King John is said to have had a hunting lodge here, but the larger part of the present building is no older than 1582. "It is a strong timber built dwelling with overhanging stories, large windows and gable ends; the moat, eight or nine feet deep, is copiously supplied with running water by a stream." The southern counties of England will yield many similar examples on various scales of these minor forms of the "Moated House," noting to wit Groombridge, near Tunbridge Wells, still doing duty as a country seat, together with Scotney Castle, erected in the time of Richard II. within range of the well known village of Lamber­hurst. But, for the matter of that, it would be difficult to find any portion of the land, north, south, east, or west, entirely devoid of the mansion fairly claiming a place under our heading. The Midlands are rich in this regard, as is natural, for are not the broad acres thereabouts the battle field, as it were, of England? Tewkesbury Abbey being the Walhalla of its mail-clad heroes. Nay, the very town itself might be denominated a "moated city," with its affluence of water­ways, inasmuch as you can scarcely walk a hundred yards through the streets of its old ­world houses without catching sight of one or other of the two winding rivers, the classic Avon and the sandy bottomed Severn, which seem to encircle it in the long reaches of their loving embrace. A place too called Burtmorton Court, near Tewkesbury, is full of curious interest, were it only to show how the modern spirit of utility can adapt the massive masonry of yore to practical purposes, for literally there is a modern farmhouse containing many good sized rooms, enclosed within the ample and lofty ancient hall; and every nook and corner is turned to good account for the purposes of the dairy farm, "to which com­plexion" the thirteenth century foundations of Burtmorton Court have been brought, moat and all! From their proverbial flatness, the eastern counties may very reasonably be expected to supply their quota of water girdled mansions. Kirtling Towers, in Cambridgeshire or Suffolk, we forget which, is one of these, and the estate, known at the time of the "Great Survey" as Chertelinge, on which it stands, once formed part of the possessions of Earl Harold. "It was then an extensive domain with its park, bestiarum silvaticarum and its fishery." 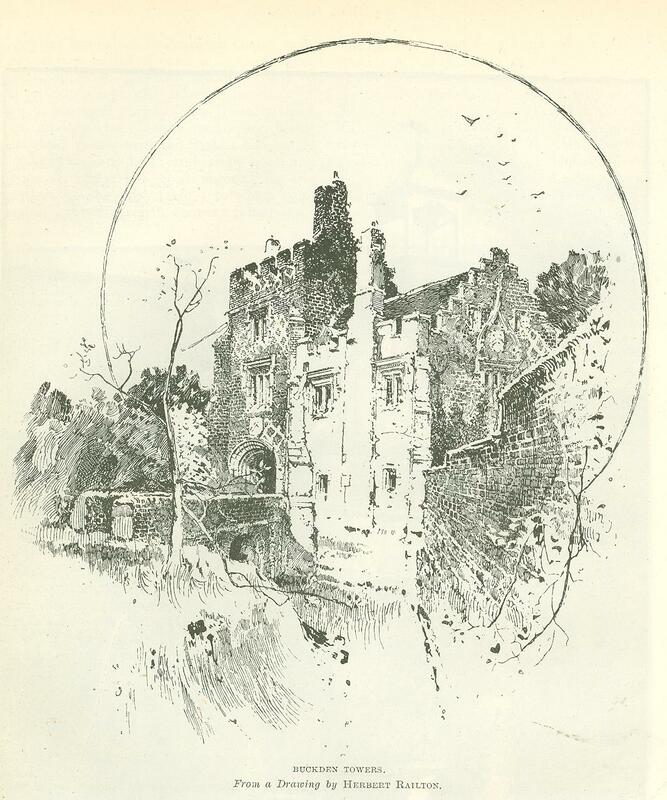 In the fourteenth century it is spoken of "as a castle enclosed by moats," but it is chiefly interesting as having been the home of the distinguished family of the Norths. Roger, the second Baron of that ilk, entertained Queen Elizabeth here for three days in 1578; at the time he was Treasurer of her household. The castle was built by his father Edward, the first Baron North, on "one of those artificial quadrangular islands which are so common in Norfolk and Suffolk, and whose history for the most part has been lost in the distant past. 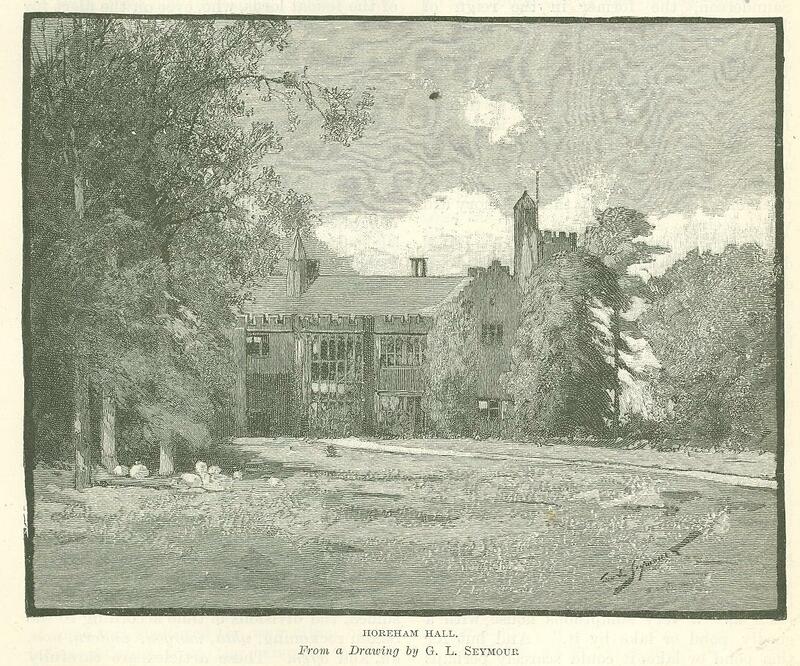 The island at Kirtling was originally a rectangle of about seven acres in extent, surrounded by an enormous moat of great depth, and fifty yards wide." ... "The remains of extensive earth works towards the east clearly indicate that at whatever time the moat was excavated it must have involved a prodigious expenditure of organized labor, and that the island was intended to serve as a place of defense and security. It is evident too, from the position of the Norman church, that we are face to face with a stronghold which existed long before the conquest. Such portion of the earth dug up to form the moat as could be spared from the construction of necessary dams was heaped up on the island, and on this plateau Edward Lord North built his mansion," "Cole, the Cambridge antiquary, paid a visit to Kirtling about the middle of the last century, when Margaretta, widow of William sixth Lord North, retained Kirtling as her dower house." Then again at Helmingham Hall, in Suffolk, we have a most striking contrast in the way medievalism still keeps its grip on the nineteenth century, under appreciative hands. 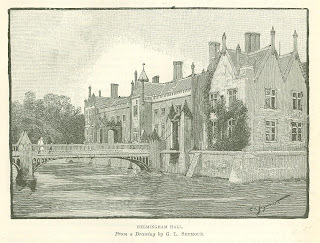 About eight miles from Ipswich on the high road from that town to Framlingham, and not far from the latter place, is situated Helmingham Hall, a moated Elizabethan mansion equal almost in interest to any in the kingdom. Standing in the midst of an exten­sive park celebrated for the size of its oak trees, and well stocked with red and fallow deer, the house is approached through a long, finely­ grown arching avenue also of oaks, having two lodges at its commencement, and gate­houses at its termination. The encircling water is crossed by two drawbridges still practicable, and supposed to be raised every night. The edifice is quadrangular in its plan, the centre occupied by a courtyard which has to be traversed to reach the hall. The entire rebuilding of that portion of this ancient seat known as the "garden front," as well. as its complete renovation and re­furnishing throughout in the Tudor fashion, are due to its present proprietors. Many of the chambers are adorned by fine old family portraits from generation to generation, from the cunning hands of Lely, Kneller, and Sir Joshua among others. Built by one Lionel Tollemache during the reign of Henry VIII. upon the site of the more ancient moated manor house, styled Cuke Hall, it is a trea­sure house of choice relics, and so perfect in its details that it is almost unique amongst our many fine old country seats. This Lionel Tollemache was the eldest son of John Tolle­mache, and was the first of the family to establish himself at Helmingham. He in­herited the property through his marriage with the daughter of the house of Cuke. Queen Elizabeth favored him greatly, con­ferred upon him the honor of knighthood, and visited him as she also did Roger North at Kirtling.- at Helmingham or Heminheham, during her progresses through the coun­ties of Norfolk and Suffolk. Whilst staying with him she stood godmother to his eldest son, and an antique lute, said to be her gift as a memento of the event, is one of the choicest relics in the Hall. It bears the date 1580, and is kept in a room adjoining the library. The library itself contains a considerable number of MSS. : one, King Alfred's Temp­tation of Orasino, and many ancient tomes; amongst others, the first book printed in England by Caxton. The property still remains in the Tollemache family. The father of the original Lionel, the John Tollemache above mentioned, was the first of the name to settle in these parts; he married Anne, daughter and heiress of Roger South, of Sawtrey, in Huntingdonshire. by no means extensive. The manor was granted to the See of Lincoln in the time of Henry I. by the Abbot of Ely, as a compensation for the privilege of making his abbacy into a bishopric. Several bishops have been buried in the parish church, and the monuments erected to their memory are worth seeing. Huntingdonshire possesses, besides Buck­den, a very fine and noble old country seat, entitled Horeham Hall, which, with its crow­ stepped gables, ornamental bricked chimney stacks, massive square tower, and beautiful bay windows, is externally a feature in the landscape not to be overlooked. Internally, the octagonal staircase and fine hall would alone demand close observation, for, having been built by Sir John Cutts, Under Trea­surer during the reign of Henry VIII., and inhabited by the Princess Elizabeth during part of the reign of her sister Mary, we may be sure there can be no lack of mind's eye historical pictures for those who have the wit to see them. The maiden Queen paid her early home more than one visit in after life. Leland speaks irreverently of its founder as "Old Cutts," but regards the hall itself as "a very sumptuous house with a goodly pond or lake by it." And but for this pond or lake, it could scarcely perhaps be reckoned in the list of moated houses. In order to bring our swallow flight over these ancient roofs to a fair conclusion, we have reserved to the last what may be called the choicest of them all, Stokesay Castle. In it we find once more an illustration of the indifference with which the early builders regarded the fact of a site being commanded by surrounding heights In olden times, as we have said, the moat was the first and strongest line of defense, and for the secur­ing of which all other considerations gave way. Very precious as a record of this im­portant feature, as of many others, is this Shropshire page from the past. Alike to the antiquary and lover of the picturesque it supplies an endless fund of research and ad­miration historically and pictorially. No fairer or more striking object of the kind could be met with in a day's march through­out the length and breadth of England. Here, upon the borders of the principality, one can readily imagine this time worn, moss grown group of tower and gable doing good service in repelling the raids and forays made in the middle ages by the then unsubdued Welsh. Fittingly does it seem to body forth the spirit of the feudal lords, who, ever on the alert for conflict, strengthened by moat and earth­work, drawbridge and portcullis, embattled tower and loop holed wall, the outposts of the kingdom. Stokesay in the reign of the first Edward, acted as one of those frontier fortresses held by the Lords of the Marches, who, under the stern sway of feudal rule, played such conspicuous parts in the history of "our rough island story." 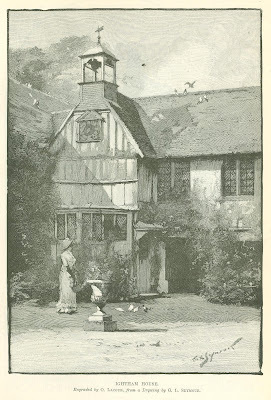 Essentially composite in its character and of course of various dates, it shows by many signs, such as the mullioned windows and gables of the hall, that the domesticities of life formed no inconsiderable part of the needs of some of the owners of Stokesay. The thirteenth century is represented by no better example of the fortified mansion, the fortifi­cation of it subsequently being a necessity of the troublous times. Few such relics have so fortunately and successfully escaped the havoc of the centuries with so little alteration. The average width of the moat is over twenty feet, with a depth of six, at one time pro­bably more. Cleared out some years ago, a few, interesting curiosities were discovered in the shape of coins, tokens, china, etc., and a somewhat mysterious stone implement, or, as is supposed, a Saxon dial pierced with a central hole for the gnomon, and six in the circumference, the latter indicating, it is as­sumed, the divisions of time according to the Saxon reckoning, uhta, morgen, undern, non, an, and aefen. These articles are carefully preserved in the building. The most striking feature on approaching the structure is the Elizabethan gatehouse replacing in all likelihood the original portcullis and drawbridge. The timbers and cross beams richly carved in places, and still well preserved, give by their time blackened lines, contrasting with the lighter and white materials, that effect of picturesqueness for which the half timbered houses of the period are celebrated. A bold archway through the gatehouse of course admits one to the court­yard. Opposite is the great hall with its three handsome mullioned and transomed windows separated by three sturdy buttresses supporting the stone roof, and at one end of it the tower. For the sake of additional domestic accommodation, this court was, for many years, encumbered with a penthouse, and other timbered erections, which although of anterior date to the gatehouse, were sufficiently modern compared to the more durable parts of the structure to justify their re­moval, considering how they interfered with the original design of the whole. Some evidence yet remains near the tower that the court was once surrounded by a strong para­pet with cross-bow loopholes, Again vivid suggestions of "the brave days of old" are aroused by a contemplation of the interior of the hall; its fine proportions and lofty, heavy, beam arched roof, its solid masonry, handsome windows, and admirable specimens of Early English corbels, whence spring the timbers of the arching roof. It boasts no fireplace, and the smoke blackened ceiling just above a certain octagonal piece of pavement indicates that a brazier was the only means in use for warming the huge apartment. A room be­low the hall at the northern end reached by a flight of steps is pointed out as a portion of the most ancient part of the mass. Lighted only by narrow loopholes, there is no doubt it was prepared for defense. Connected with this apartment is a deepish well, which on being emptied some years ago proved to have been made a receptacle for the debris of the feasting and wassail carried on in the baronial hall, inasmuch as amongst the noisome rubbish were discovered the skulls of an antlered deer, a wild boar, and the bones of other animals such as sheep, oxen, etc.- evidence that sanitation did not enter largely into the considerations of the medieval ages and sages. This well is con­nected with the moat. Upwards, and out­side the hall, a stone stair conducts to what was called the solar or withdrawing room, and there are traces that at one time a roof of some sort sheltered the way taken by the ladies retiring from the banquet to their special domain. Another ascending stair of solid oak leads to two chambers on the first floor, known as the priests' rooms - one paved with curious tiles, but both indifferently lighted by an ogee window of more recent date, and others .of lancet form. Above these again, is a more ample, better lighted apart­ment, not always existing without divisions. The withdrawing room before mentioned likewise contains a beautifully carved oak fireplace of the date of James or Charles; added obviously on the introduction of such luxuries by one Sir Samuel Baldwyn, a cultured gentleman of refined taste and an erewhile owner of Stokesay. Many more inferior apartments above and below stairs, wainscoted, paneled, and begirt with the fixtures and decorations of various periods, connected by external as well as in­ternal stairs, claim the antiquary's close attention. The great tower, as a conspicuous feature of the old pile, should be included in this last remark, for many of the ways of communication from one floor to another are carried up within the enormous thickness of its walls, and each story of it is well worthy of study. Crowned with embrasures, loop­ holed battlements, and the remains of some construction for protecting the defenders from the assaults of the catapult, and other primitive weapons of war, mark it as of great antiquity, but disputes arise among the learned in such matters as to whether it or the hall was the first to be erected. The tower - sixty feet high - is supposed to have been built by one Laurence de Ludlow, about 1280, when he received a permit to fortify his mansion. Impossible here would it be to wade through the pedigrees of the various families who have held it. The Ludlow's are said to have done so for over 200 years, until by marriage it seems to have passed to the Verdons or Vernons, then by the same means to the Mainwarings, and so on to the Bald­wyns, &c., until at the termination of the civil wars, it was disfortified. Since then it has been free from strife and turmoil, and would have fallen into absolute decay and ruin but for the wisdom and generosity of Lord Craven, who put a stop to its further desecration. 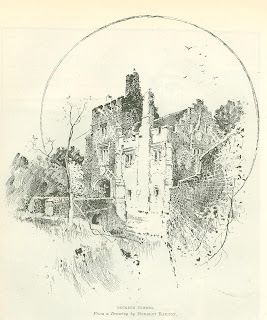 So, within six or seven miles of Ludlow, there it still stands - a unique monument of the long ago, and, like the rest of the moated castles, mansions, and manor houses of England, invaluable at once to the historian, the poet, the antiquary, and the artist. Originally published in The English Illustrated Magazine. 1889.